The state votes on the seventh and final phase of assembly elections today for 21 seats in the 87-member assembly. “They (people) are more concerned about local problems and basic issues such as bijli, sadak, pani (power, roads and water)," said an official of the Election Commission of India, who didn’t want to be named. 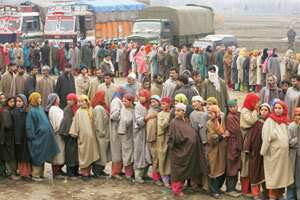 “This time it was the separatists who asked the people to abstain from voting and not the militants. Hence, the level of fear has reduced. Also, the credibility of the election process has gone up." Data released by the Union home ministry showed violence in Jammu and Kashmir has come down from 18,106 incidents between 1999 and 2003 to 7,769 between 2004 and 2008. Prithviraj Chavan, minister for the Prime Minister’s Office and the Congress party leader overseeing Jammu and Kashmir, attributed the high turnout to developmental issues taking centre stage during the electoral campaign. “People have seen the benefits of the development. The Rs24,000 crore economic revival package for the state (announced by Prime Minister Manmohan Singh in 2004) has started trickling down as road, railway and hospital projects," he said. Interestingly, before the poll panel announced election dates, political parties, including the National Conference, raised concerns about the timing of polls. The state was on the boil following a violent agitation in June and July over the government’s decision to transfer forest land to the Shri Amarnath Shrine Board, that was supported by people in the Hindu-dominated Jammu region and opposed in the Muslim-populated Kashmir valley. The land transfer issue led to the fall of the ruling alliance of Congress and People’s Democratic Party, or PDP, with the latter—which has a considerable strength in the valley—withdrawing support. Said T.S. Krishnamurthy, former chief election commissioner of India: “Heavy police protection during the elections this time has enabled people to come out and vote without fear. Further, the election commission has conducted polls in several phases. All these factors has led to a good voter turnout." “We have gone from house to house to convince the voters that if we do not take part in the election process, we will be trapped in-between the two countries," said a lawmaker from Jammu and Kashmir, who did not want to be named. An analyst gave credit to the state’s political parties. “We have underestimated the role of political parties such as the Congress, PDP, National Conference, etc., in the past four-five years. What these parties have done is to provide a minimal atmosphere to engage with a lot of people," said Pratap Bhanu Mehta, president, Centre for Policy Research, a New Delhi-based think tank. “Earlier, elections were always under the shadow of militancy. However, now militancy is very delegitimized." “In 2008, one thing that people in the state have been convinced about is that there is a certain amount of credibility to the electoral process and that it is genuine." said Mehta.